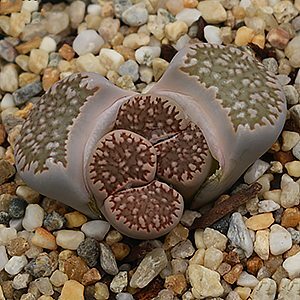 Lithops are a long lived succulent that can be grown from seed, many species are available for sale as plants from specialist nurseries and in Australia. The botanical name comes from two greek words, and loosely would mean ‘Stone Face’. Originally from the dry plains of Southern Africa where they grow from grasslands to rocky slopes, because of their look they are commonly called ‘living stones’. These are a strange plant, flowers that open in the afternoon and close before dark. Plants that look a lot like pretty little stones, and those flowers, well they are larger than the plant itself. 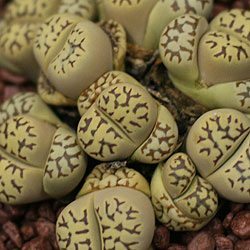 The main attraction of growing Lithops is the fantastic patterns and ‘stone like’ appearance of these interesting plants, they do flower, and the flowers are very pretty, however they may take 4-5 years to reach flowering size, so be patient. These flowering succulents have become very fashionable as house plants, indeed they seem to be ‘collectable’. Growing Lithops is fairly easy to grow and they make a great indoor plant. They are long lived, and with a little care will last for 30 to 50 years. Growing in areas of very low rainfall, so a free draining growing medium is required. Away from their natural environment they are best grown in pots. Try an indoors or covered position with 5-6 hours sunlight a day. Try growing most species in a 30cm deep pot, you can use pumice, or a free draining potting mix designed for succulents, set in stone chips, very course sand, gravel or surrounded by small stones. Water well at the beginning of Autumn but let the soil dry out completely between waterings. (one good soaking every two weeks for 8 weeks). Dormant during the hotter summer months and do not require much or any water at all, an occasional very light watering, perhaps once every 6 weeks during this period is all that is required, do not deep water during summer. Winter watering is again reduced to minimal. In Spring as the plants will put on new leaves, its time to water again. Lithops require around 5 hours of good light a day, and the best light will be morning light rather than hot afternoon sun. Hot afternoon sun can cause leaf burn. You can grow these interesting succulents from seed, the easiest method of propagation is by division of offsets as they form. 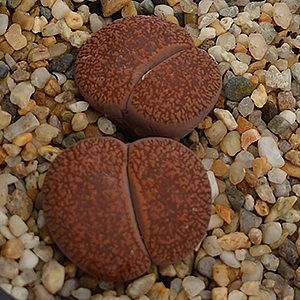 Lithops seed can take 3 – 12 months to germinate and germination can be sporadic over this time. Part of the Aizaceae family and this group, of plants include a number of succulents differing in form greatly. Varieties include. L. dorethea (pictured top right) are all worth seeking. L. optica ‘Rubra’ is a lovely bright red species, rare worth looking for. L. karasmontana from the Karas mountains, oval shaped and variable in colour. L. bromfieldii v. insularis ‘sulphurea’ a fascinating green cultivar from Japan. These are usually a long lived plant however problems can occur, we list some of the symptoms. Swelling leaves Overwatering can cause the leaves to swell. Leaves becoming soft Usually caused by overwatering, and this can cause the plant to die. Leaves wrinkling in summer Usually occurring through natural summer growth habit. Lithops growing tall. This is when they go pale (etiolate) and grow taller than usual, and it is usually caused by a lack of light. These are a plant that develops a long taproot, soothes need a tall pot. They also need exceptionally good drainage, so us a pot with large drainage holes, preferably terracotta.